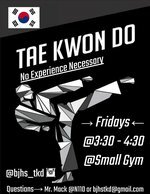 The Tae Kwon Do club is open to all students of BJHS. If you have a passion and energy to train with us, you are more than welcome to join our club. Besides a uniform, there are no eligibility requirements (if you do not have a uniform the club can provide sources). The Tae Kwon Do club meets every Friday afternoon from 3:30pm-4:30pm. Practices involve stretching, basic moves for kicking, punching and blocking for self-defense. It also includes ‘poomsae’ (sequences of predefined moves). All of these will help a member’s concentration, memory, and physical coordination, but most importantly the martial arts emphasize courtesy, integrity, humbleness and self-control.